An elegant 9ct white gold, diamond and cultured freshwater pearl ring. Elegant jewellery for any occasion. A statement piece that is now and forever. 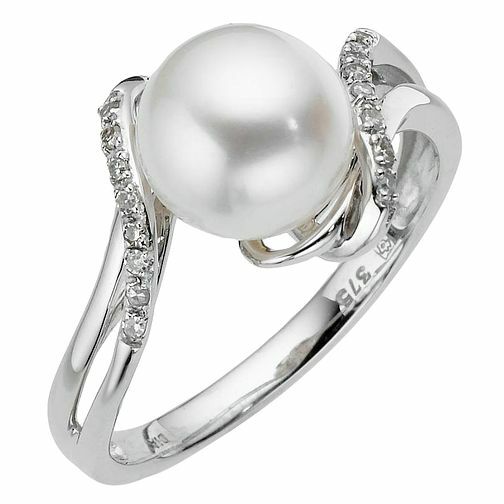 9ct White Gold Diamond & Cultured Freshwater Pearl ring is rated 2.6 out of 5 by 5. Rated 1 out of 5 by Anonymous from Lovely style but poorly made I loved this ring until one of the diamonds fell out after only three weeks. Very disappointing. I expected better from EJ. Rated 1 out of 5 by Anonymous from I loved this ring I fell in love with this ring when I saw it for my engagement ring, something a little different and I've always liked pearls. Only to have the pearl fall out 4 months into wearing it. Very disappointed and now I await Ernest jones response to see what they will be do about the faulty ring ? ?